Euphorbia lagascae is an annual Mediterranean plant that naturally produces vernolic oil, a rich source of the common plasticizer vernolic acid, which is used in a range of industrial applications, from paints to PVC to blown polyurethane foam. 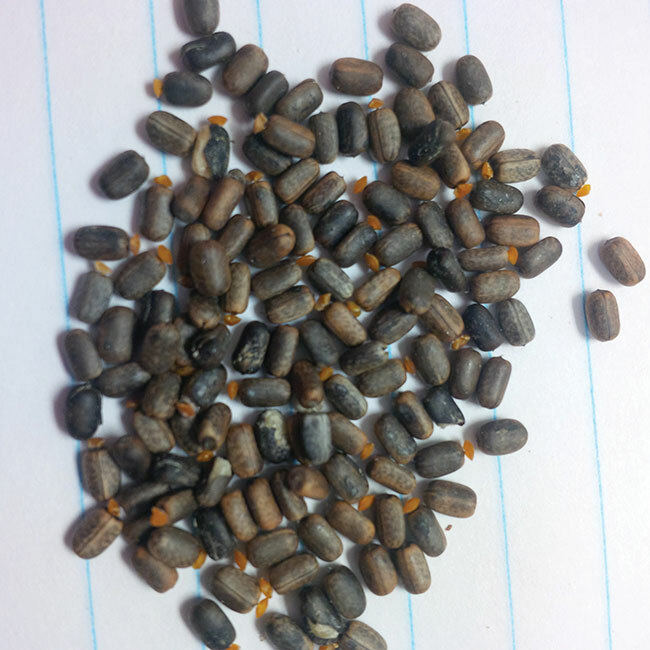 E. lagascae is one of two novel oilseed crops recently tested by a joint Ontario Ministry of Agriculture, Food and Rural Affairs (OMAFRA)/University of Guelph research team for commercial production in Ontario; the other is Centrapalus pauciflorus, a crop native to Africa. According to Jim Todd, industrial crops specialist for the Ontario Ministry of Agriculture, Food and Rural Affairs (OMAFRA), common sources of vernolic acid are soybean oil, linseed oil and petroleum, but for each of these, the acid must be synthesized from the oil via a series of chemical reactions. By contrast, the two novel oilseed crops produce vernolic acid naturally; it only has to be extruded from the oil. One aspect of Todd’s job involves looking for alternatives to petroleum. In 2013, E. lagascae and C. pauciflorus piqued his interest. While both crops had been tested in the United States, neither had been tested under Canadian growing conditions. Between 2014 and 2016, Todd and his collaborator, Rene Van Acker, dean and professor at the Ontario Agriculture College at Guelph University, ran basic agronomic field tests on both crops to assess whether the plants would grow in southwestern Ontario, and evaluate germination and flowering rates, seed yield and seed oil content. They found that both crops grew and produced seed, but exhibited low germination rates, such that transplants had to be used to ensure the researchers could collect complete field season data. Both crops produced a large amount of vernolic oil – about 45 per cent oil content in the case of E. lagascae, and between roughly 28 and 35 per cent oil content in the case of C. pauciflorus. About 50 per cent of the oil was vernolic acid in the case of E. lagascae, compared to about 70 per cent in the case of C. pauciflorus. But E. lagascae emerged as the favourite due to a very basic advantage: the plant produces three-lobed capsule-like seeds, making it relatively easy to harvest. The crop produces a lot of latex, Todd says, but if a drying agent is used prior to harvest the crop can be combined. 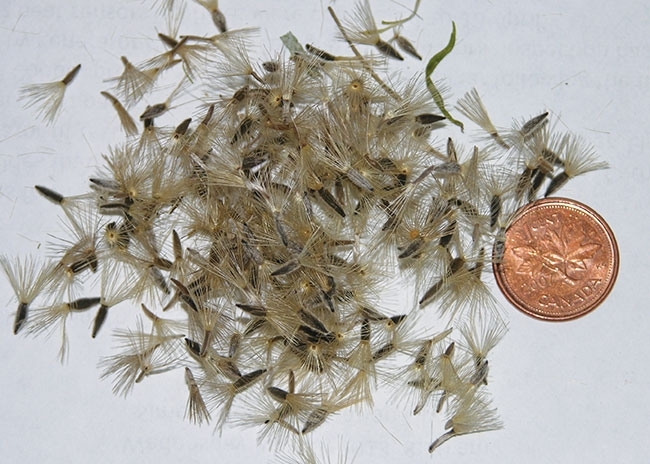 On the other hand, C. pauciflorus produces dandelion-like flowers with an abundance of fluffy seed, which makes harvesting a “huge challenge” with standard equipment, says Todd. C. pauciflorus produces dandelion-like flowers with an abundance of fluffy seed. Although E. lagascae shows promise in terms of its high vernolic oil and acid content and harvestability, there are several obstacles that must be overcome before the crop can be introduced to commercial field production in Ontario. One key problem that emerged from the three-year trial was the germination rate of E. lagascae. Over the three years of the trial, germination was highly variable, but typically lower than 30 per cent. Interestingly, seed that had been planted in May or overwintered would sometimes undergo germination six to eight weeks after sowing, which indicated to Todd’s team that the seed might contain a dormancy factor that inhibits germination until certain conditions are met. Along with Van Acker’s lab, Todd’s team has enlisted the help of Istvan Rajcan, a soybean breeder at Guelph University, in a three-year project to analyze the reasons for E. lagascae seed dormancy and potentially breed an improved variety. This project, which is funded by OMAFRA and the University of Guelph, is now in its second year. A secondary goal of the breeding project is to produce a large amount of seed that can be sent to the United States Department of Agriculture’s pilot scale oilseed extraction facility in Illinois, where several hundred litres of oil can be extracted and sent out to research labs and interested industry members for testing. Another major hurdle to overcome is the crop’s competitiveness in the field. E. lagascae is not competitive to weed pressure early on, and because no herbicides are registered on the crop, Todd’s team has also begun a herbicide tolerance trial to investigate options for weed control. E. lagascae is more resilient when it comes to insect pressure; the plant’s latex deters insects. But the crop is susceptible to root disease pressure, Todd says. “There’s a ways to go,” he says. Despite these obstacles, Todd sees E. lagascae as a potential competitor to epoxidized linseed oil, which is a higher-value product than soybean oil. Vernolic acid produced from the novel oilseed plant can be used in a wider variety of processes than that produced from linseed oil. But apart from the premium growers might expect from the new crop, one of its chief advantages may be its utility as another cropping option they can use to diversify rotations. “It would be a commodity crop like any other oilseed, and another crop in the rotation,” he says. Improving wheat yields with oilseed radish?